Welcome to our site. We would ask that you check out each of our pages to see the paintings of our artists. You can reach us at our email. Some paintings are available for sale. If you want to learn how to paint or if you are interested in other artistic endeavours please see Haliburton School of the Arts. Summer courses fill up quickly. Much has happened since I started this blog in 2010. In the meantime our group members continue to meet at the Haliburton Museum most Thursdays from 10am – 1pm. In the next months I will be uploading new art work created by our artists. Please subscribe if you wish to be kept updated. 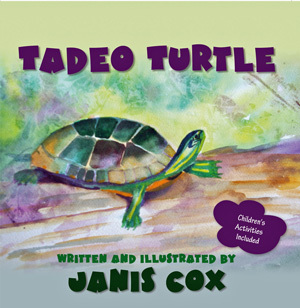 I have become a published author of Tadeo Turtle – an illustrated children’s book for ages 2-8. Please visit me at Janis Cox. We would love to hear from you. Please use the contact form below to contact us. There is a good book called Outliers which states that the most important way to hone a craft is to practice. This is more important that innate ability. The more you work at something the better you become. It talks about the 10 000 hours we need to master a craft. So all you artists – start painting. Here is a wonderful website that can help you in your painting passion.